Director/Producer – Charles Band, Screenplay – Silvia St. Croix & August White, Photography – Keith Duggan, Music – Roger Ballenger, CGI/Digital Effects – Mid Canada Production Services, Creature Effects – Magical Media Industries, Inc. (Supervisor – John Carl Buechler), Production Design – Elvis Strange. Production Company – Talos Entertainment/Shoot Productions. Sarah Leigh is the only survivor after Millard Findlemeyer invades the family bakery and kills her father and brother. One year later and with her mother drinking heavily, Sarah is struggling to keep the bakery afloat on her own. However, she is facing pressure to shut her down from Jimmy Dean who is about to open a restaurant across the street. News then comes that Millard Findlemeyer has been executed. As Sarah catches Dean’s spoilt daughter Lorna sneaking into the bakery to plant a rat, the gingerbread man she has just placed in the oven comes to life. She realises that Findlemeyer’s spirit has been incarnated in the gingerbread man. It pursues her, Lorna and the workers around the bakery, determined to kill them all. Producer and occasional director Charles Band has been one of the most prolific makers of low-budget films in the last half-century. Band began making movies in the 1970s. Along with his now late father Albert, the two formed Empire Productions in the 1980s and went on to set up Full Moon Productions and a variety of successors to that. During his time, Charles Band had put out multiple series of low-budget genre films including the Ghoulies, Trancers, Subspecies, Prehysteria! and Puppetmaster series, among many others. (See below for Charles Band’s other films as director). The Gingerdead Man is another of Band’s low-budget monster movies and was promptly multiply sequelised and even crossed over with other Band creations (see below). 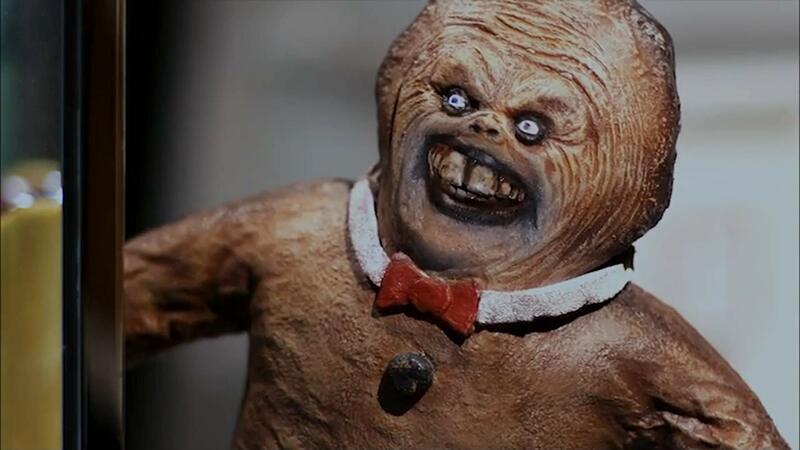 For The Gingerdead Man, Band has essentially purloined the plot of Child’s Play (1988) and sequels – Gary Busey’s Milland Findlemeyer is another variant on Brad Dourif’s Charles Ray who, instead of reincarnating in a child’s doll, comes back to life in the body of a gingerbread man. Thereafter the two films follow near-identical paths with the Chucky doll/gingerbread man pursuing victims and despatching them along with taunted insults/one-liners. At which it must be said that Gary Busey is perfectly suited to doing the snarling badass taunts this sort of role requires. On the other hand, The Gingerdead Man is hamstrung by its cheapness. Bar a couple of scenes, the action is confined to the storefront and kitchen of a bakery. Not even the scene where Gary Busey is executed is depicted. The title character is reliant on Band regular John Carl Buechler’s cut-price makeup effects, which are even cheaper and less convincing than usual. Unlike say the dolls in the Puppetmaster series, the Gingerdead Man gets no personality beyond Gary Busey’s voicing and is a weak threat. Certainly, there is the appealing ridiculousness of one scene where the Gingerdead Man drives a car at a victim but the various despatches are otherwise unmemorable. The film produced several sequels with Gingerdead Man 2: Passion of the Crust (2008) and Gingerdead Man 3: Saturday Night Cleaver (2011). The Gingerdead Man was then crossed over with the Evil Bong series, which features a demonic bong pipe, in Gingerdead Man vs Evil Bong (2013). Charles Band has produced over 200 films. As director, his other genre films include:- Crash (1977), Parasite (1982), The Alchemist (1983), Metalstorm: The Destruction of Jared-Syn (1983), an episode of The Dungeonmaster/Ragewar: The Challenges of Excalibrate (1984), Trancers/Futurecop (1985), Pulse Pounders (1988), Crash and Burn (1990), Meridian (1990), Trancers II (1991), Doctor Mordrid (1992), Dollman Vs. the Demonic Toys (1993), Prehysteria! (1993), Head of the Family (1996), The Creeps/Deformed Monsters (1997), Hideous (1997), Mystery Monsters (1997), Blood Dolls (1999), Puppet Master: The Legacy (2003), Dr Moreau’s House of Pain (2004), Decadent Evil (2005), Doll Graveyard (2005), Evil Bong (2006), Petrified (2006), Dead Man’s Hand (2007), Decadent Evil II (2007), Dangerous Worry Dolls (2008), Evil Bong II: King Bong (2009), Skull Heads (2009), Evil Bong 3D: The Wrath of Bong (2011), Killer Eye: Halloween Haunt (2011), The Dead Want Women (2012), Devildolls (2012), Puppet Master X: Axis Rising (2012), Ooga Booga (2013), Unlucky Charms (2013), Gingerdead Man vs Evil Bong (2013), Trophy Heads (2014), Evil Bong 420 (2015), King of Cult (2015), Evil Bong: High 5 (2016), Puppet Master: Axis Termination (2017) and Evil Bong 666 (2018).